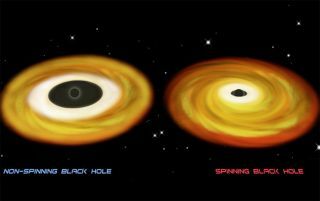 This illustration shows a gas disk orbiting a black hole, with X-rays pouring out of the inner, white-shaded region. For the non-spinning black hole (left), this inner radius is large. For the fast-spinning black hole (right), the gas can orbit very near the event horizon, so the radius is much smaller. X-ray vision has brought astronomers closer than ever to completely characterizing a black hole, a place where strange things happen. Astronomers measured the spinning speed of three black holes, finding that one rotates at a breakneck 950 times per second, nearing its theoretical rotation limit of 1,150 spins a second. The black hole lies within the constellation Aquila (the Eagle) about 35,000 light-years from Earth. The finding represents an important step toward understanding these invisible objects. When any mass, such as a star, becomes more compact than a certain limit, its own gravity becomes so strong that the object collapses to a singular point, a black hole. The spin of a star is thought to translate into spin of a black hole that forms from the star's collapse. With its mass much more compact, the spin rate ought to be phenomenal, much like a skater pulls in his arms to increase speed when performing a pirouette. While astronomers have calculated the masses of more than a dozen black holes, spin-speed measurements have remained elusive. Until now, the spin rate of only one other black hole has been accurately measured, according to the researchers. "Ever since the community figured out many years ago how to measure black hole mass, measuring spin has been the holy grail in this field," said Jeffrey McClintock of the Harvard-Smithsonian Center for Astrophysics (CfA) in Cambridge, Mass. A black hole's gravity, at a distance, behaves like that of a star of the same mass. If the Sun were to suddenly become a black hole, for example, its gravitational effect on Earth would not change. "When you take a black hole and you try putting an object into orbit around it, you have no trouble if you're doing it at a large distance," said CfA's Ramesh Narayan. But as swirling matter gets closer to a black hole, it starts orbiting faster and faster until it reaches the jaws of the dark behemoth. Just before the gas and dust get devoured, the matter heats up to millions of degrees, unleashing jets of X-rays. The scientists, led by McClintock and Narayan, used NASA's Rossi X-ray Timing Explorer satellite data to measure this radiation and calculate the area of this disk of radiation (seen in images as a bright-white ring around the black center). "Before, [the matter] was swirling around, happily, very slowly just spiraling in, and then it reaches this radius and then bang, it just freefalls into the black hole," Narayan told SPACE.com. Inside this radius, the gas is falling in so quickly it doesn't send out much radiation. The faster a black hole spins, the smaller its critical radius. That's because when a black hole is spinning, it drags space-time around with it. So if surrounding matter is spinning in the same direction as the black hole, it gets tugged along due to this so-called frame-dragging effect. "The space is being pulled, so it's helping the particle go around, so it's able to hang on much closer to the black hole," Narayan explained. "If a particle is going around a black hole in the same direction as the spin of the black hole, then it turns out that it can be comfortable. It's able to find a circular orbit even at much smaller radii," Narayan explained. They found two of the black holes spin at less than 50 percent of their maximum rates, while the black hole called GRS1915+105, which has 14 times the mass of the Sun, rotates between 82 and 100 percent of its maximum spin speed. Each black hole is part of what's called an X-ray binary system, in which two objects orbit each other with gas from one-a normal star like the Sun-getting pulled toward the black hole. The results are published in today's issue of the Astrophysical Journal.